Mark Grace, heart of the many Cub teams he was apart of in his Chicago tenure, sang the stretch today at Wrigley and cut my heart out. As all Cub fans know and what truly makes the "Take me out ..." song during the seventh-inning stretch the Cub's own, is the changing of the words "Home Team" to "Cub-Bees." 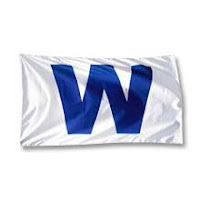 It is as essential to the Cubs as pinstripes and ivy, Old Style and losing. It is the American flag lapel pin of sports. It shows your allegiance to the team and fans and is always, ALWAYS required. It may be contractually obligated for would-be stretch singers. If there were a list of 5 people in this world who know this unequivocal fact, Mark Grace would be 3 of those people. Yes, Mark Grace is an EX-Cub. All the good ones since 1980 are. Dawson, Maddux, Eckersley, Wood, Sosa. (Note: Mr. Company Man Sandberg is the only one I can think of who didn't leave.) Yes, Grace won a World Series with Arizona and now he's the tv color man but if I thought he still had some ivy in him. As a song itself it was beautiful. The man knows his "Take me out to the ball game." Perfect rhythm. Perfect pitch. Perfect cadence. Right in time with the music. The excitement mounted as I wondered if he would move through "Cub-bees" smooth and comfortable like an old leather chair, or blow my eardrums of anticipation with a barrel-chested "CA-HUUUBBB-BEEEEEES" bringing the wrigley crowd to a frenzy and a tear to my eye. I felt the soft "Huh" sound slip into my soul, nearly undetected. Momentary confusion was severely removed by the hard steel of betrayal, sliding between my shoulder blades and firmly into my heart. "Ooome Team" finished the blow. Loud and sure. Not even a hint of regret in his dead eyes. As he wiped the blood of the knife he said, "Kerry Wood, welcome back," as if to say to his old teammate - "Sucker! Want to see my ring?" I want to say the fans immediately dropped their beers and charged to the booth to carry out retribution on this traitorous son but they just took another sip. I at least expected my beloved spokesman Pat Hughes to decry the hateful deed but not a word. I haven't missed Ron Santo or Harry Carey more than at this moment. At least the Cubs didn't let me down and have given me a renewed hope in this ramshackle team. They responded immediately with two runs for the lead and, though giving one back to the D-bags in the ninth, scrapped their way through to assure the victory and the series win. The game-ending strike out came like a triage plasma bag, jerking me back from the light. Whatever doesn't kill us makes us stronger. How strong remains to be seen but I have renewed hope for this team. Goodbye mr. grace ... and watch your back.